the capital of the Democratic Republic of Congo, on Sunday. Church started at 6:30 am and the sermon was over around 8:20 am. The priests and the people started to march for about 100 meters (30 min), then the population was attacked by surprise from behind and in the front with jeeps and guns. Given the people were close to the priest the police tried to find a way to separate the people from the priests. The people were kneeling and praying, than getting up and continuing while singing. 1. First, when the marchers were surrounded the priests instructed the people to sit on the floor. The priests started arguing with the police to let the people march. 2. Second time when the marchers saw that the police managed to separate one of the priests from the group, everyone sat on the floor again while other priests negotiated with the police. 3. On the third occasion, same thing people were kneeling, sitting and standing in one place. 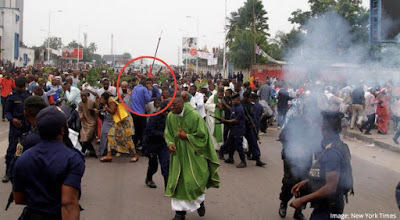 Kabila's security forces started pulling the priests away from the people in an attempt to separate them and drive them back to the church. The marchers quickly recognized the strategy to take the priests back to the church so that the people would be isolated from religious leaders. The people insisted on following the priests back to the church. The police began preventing the people from walking back to church, and came in the middle of the crowd to pull away the priests. The police started pushing people with their guns to try to disperse crowds. Once they managed to separate the people from the priests, they started firing tear gas in the group of people and within a matter of seconds at least 20 tear gas canisters were released. People started running in different directions and others laid on the ground and took cover. MONUSCO sent one Jeep that was filming and and the press was documenting the repression. The police are currently shooting in the air and going on avenues trying to disperse people from gathering and marching. Click here to demand justice for the Congolese people!